This page sets out what little I have on the dress and equipage generally of the Local Militia of Lancashire, and specifically for the Amounderness, Blackburn Hundred (Higher and Lower Divisions), Bolton, Leyland & Ormskirk, Liverpool, Lonsdale, Manchester, Middleton, Newton & Failsworth, Oldham, Prescot, Trafford House & Hulme, Warrington and Wigan regiments. All were formed in 1808, though the dates of the commissions of their commanding officers vary. The page is certainly nowhere near complete; some important gaps will be obvious, making it more of a template requiring continual additions and revisions. I have borrowed images from the British Military Buttons site; some from the Dixon Pickup collection are particularly useful, and are credited below. Images and info from the Reynolds Lancashire notebook at the V&A are courtesy of Ben Townsend. Click all images to enlarge. This prompts the question for counties such as Lancashire with more than one militia regiment: the same as which regiment? Here the pattern was that of the 2nd and 3rd Royal Lancashire Militia: dark blue facings, gold metal, buttons regularly spaced. Among these Local Militia regiments, officers’ coats and jackets show a fair degree of uniformity, though some details – buttons, belt plates – remained regiment specific. Corporals and privates wore the pointed lace of the Second and Third Militia, with a single dark blue stripe. (The Hamilton Smith chart shows this lace, the same for all three “regular” regiments of Lancashire militia, with the blue stripe towards the outside, though a surviving sample for the First shows the stripe placed centrally.) A notebook of the clothiers J & B Pearse, kept at the Canadian War Museum, has an entry for the Warrington Local Militia (see below) showing that the pointed laces of the Second, Third and Local Militias were of the “Colestream” form, the ends of each lace folded back diagonally to create a neat point, rather than being cut to shape. 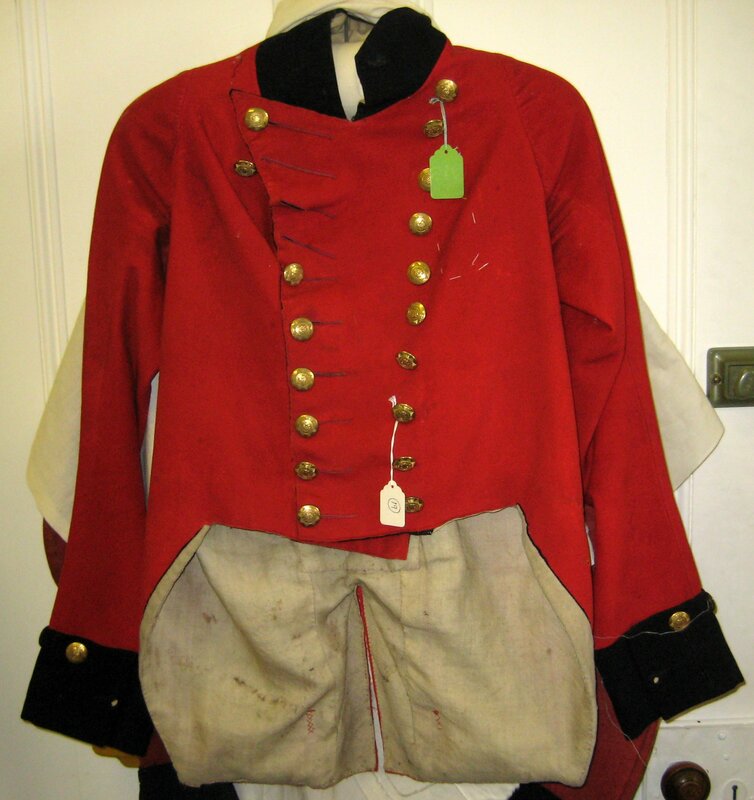 Drummers of regiments with blue or “Royal” facings, the Lancashire Local Militia included, did not have jackets in reversed colours as did those of differently coloured regiments up to 1812, but wore red faced dark blue. 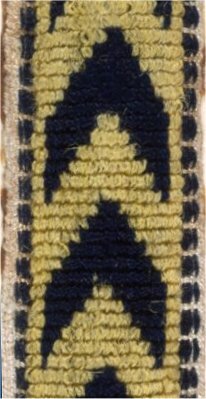 The drummer’s “broad” or “double” lace for the “regular” Lancashire Militia, was white with a dark blue chevron, the “narrow” drummer’s lace half that, i.e. white with a dark blue diagonal band. However, the Pearse sample of the broad lace for Warrington (below) shows narrow dark blue edges and a yellow ground. It is not clear whether the other Local Militia regiments had drummer’s lace of the “regular” or Warrington varieties. The rather arcane details of the drummer’s jacket lacing are discussed under the Warrington regiment. A circular brass cap plate with some of the same elements as those discussed above – “Lancaster” in old English capitals, above a rose and palm leaves – appears on a “Belgic” drummer’s cap attributed to the Lonsdale regiment (see below), but may also be of a pattern worn generally by the musicians of Lancashire’s Local Militia. Regulations for Local Militia allowed for either white or black accoutrement belts, depending on the majority of the equipments of the volunteer corps transferring to the new regiments. The Oldham sword belt noted below is white, indicating that this regiment at least wore white accoutrements; it is likely that most or all of the rest did likewise. Most regimental colours, in either dark or “garter” blue, are recorded, in varying degrees of detail, in a notebook of militia colours once at the RUSI (microfilm now at the National Army Museum). For this, I have used Reynolds’ summary. With some exceptions, the default pattern, where no other details are given, is a Union wreath enclosing the regimental title, as shown for the Oldham regiment. Lieut Col Comm Nicholas Grimshaw, 24 September 1808. Two items in WO 79/2 at the National Archives, a book of miscellaneous documents and a regimental account book, provide considerable information; many thanks to Eamonn O’Keeffe for so kindly sharing images of these. In 1809 the regiment purchased outfits for the sergeant major, drum major, 49 sergeants, 50 corporals, 26 drummers and 1008 privates. The accounts show that the costs of those for the sergeant and drum majors were considerably in excess of the government allowance, and that both appear to have worn caps rather than hats. The extra tailoring on the drum major’s suit was well in excess of the usual costs of alteration and fitting for other ranks. Twelve musicians’ suits were purchased separately for the band. The tailor employed for altering and fitting garments, perhaps within the regiment, also made “button holes” (presumably meaning the lace loops) and fitted fringe to both flank companies’ wings at 9d per yard; he was also responsible for making up undress jackets. Among the necessaries supplied in 1809 were long gaiters, and linen trousers (presumably white) and foraging caps for undress. In March 1813, like other Local Militia of four years’ service or more, the regiment was instructed to withdraw and return to the Storekeeper General its breeches and long gaiters, and to replace them with grey trousers and short gaiters according to sealed patterns to be supplied. Fifes, drums and (apparently) brass instruments were purchased in 1809 and further band instruments in 1811. Also bought in 1811 was a bugle horn, presumably for the light company. 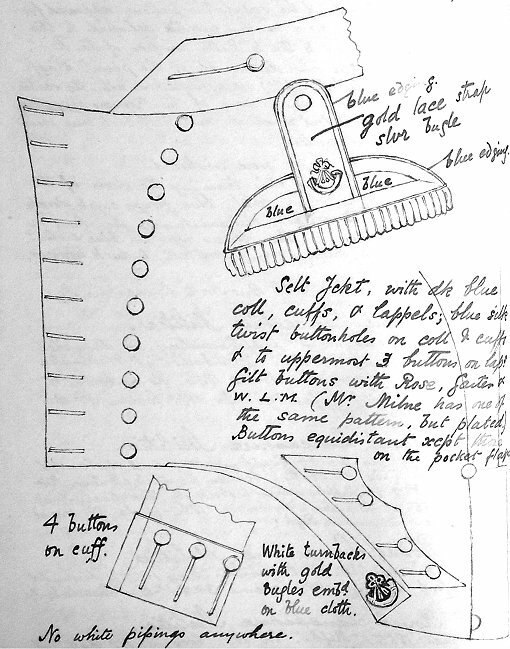 In 1809 500 sets of buff leather accoutrements were supplied by a Mr Tatham, the remainder by a Mr Gilpin, in lieu of the tan accoutrements supplied by Ordnance. The belt plates for the sergeants were separately supplied by a Mr Johnson, so must have been a superior or gilt version of those of the privates. 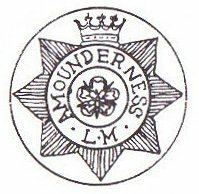 Ripley and Moodie show a drawing of a gilt button, diameter 22 mm, with a coronet over an eight rayed star bearing a simple garter inscribed “● Amounderness ● / L ● M”, enclosing a rose. The National Army Museum inventory lists an unspecified item or items of uniform for this regiment, of which I can’t yet give details. Regimental accounts for May 1809 include “a Pair of Embroidered Gold & Silk Colours with gold Crimson Tassels Lance & Oil Skin Cases” at £41 18s, over twice the allowance for a pair of colours made by the Ordnance. 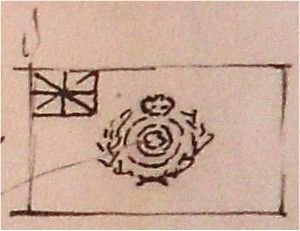 A detailed drawing of the regimental colour in WO 79/2 [image here in due course] shows a Union canton, presumably with a blue field, each of the three other corners containing a small red rose of Lancashire. 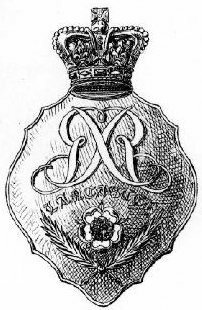 At the centre, below a ducal coronet, is a garter inscribed in Roman capitals “AMOUNDERNESS ● LOCAL ● MILITIA +“, enclosing the arms of Lancaster – on a blue chief, a gold fleur-de-lys, above a red field with a gold lion passant guardant – on a rococo shield edged in gold, above crossed sprays of laurel(?). The spearhead is open in form with an internal cross, the cord looped to hold two tassels. Contingent expenses for 1809 include a set of camp colours at 19/6d. Lieut Col Comm John Hargreaves, 28 January 1809. The Reynolds notebook includes a simple sketch of the regimental colour, from the notebook of militia colours at the RUSI (microfilm now at the National Army Museum), showing a crowned garter and wreath enclosing a rose, and describing the field as garter blue, the rose as red, and the garter as inscribed “Blackburn Hundred Loc. Militia Higher Division”. Lieut Col Comm Henry Hulton, 21 March 1809. Lieut Col Comm Ralph Fletcher, 24 September 1808. The regiment’s colours were later placed in the parish church, and appear to have been removed some time before the building’s demolition. Lieut Col Comm Sir Thomas Dalrymple Hesketh, 28 December 1808. At York Museums is an officer’s jacket, scarlet with dark blue collar, lapels and cuffs. The front has two rows of ten large buttons, with scarlet twist button holes on the scarlet side, the top four holes progressively longer and set at an angle. The collar has no buttons. The cuffs each have four large buttons with dark blue twist holes. The white turnbacks are narrowly edged in dark blue. (I have not seen this jacket, so cannot describe the rear details or the facing sides of the lapels.) No epaulette is attached. The gilt buttons on the jacket match surviving examples, 14 mm and 22 mm diameters, showing a coronet on an eight rayed star bearing a simple garter inscribed “Leyand & Ormskirk / L ● M”, enclosing a rose. 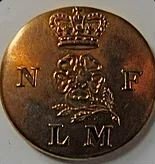 On the British Military Buttons site appears a button of a different design, slightly convex, 15 mm in diameter, showing a coronet over “L ● M” surrounded by “Leyland & Ormskirk”. This is silvered, which may indicate a sergeant’s button. Reynolds describes the regimental colour, from the RUSI notebook of militia colours, as blue, inscribed “LEYLAND & ORMSKIRK REGT. / LOCAL MILITIA”, the “T” of “REGT” being a smaller letter above a stop. He gives no other details. Lieut Col Comm William Earle, 28 January 1809. Reynolds describes the regimental colour, from the RUSI notebook of militia colours, as garter blue, inscribed “Liverpool / Local / Militia”, with no further details. Lieut Col Comm John Bradshaw, 24 December 1808. Reynolds, in his Lancashire notebook, records that “FCG had in his collection a jacket of the 1814 type; scarlet faced plain dark blue without lace (twist loops no doubt). Buttons with a Crown, a Lion and ‘LLM’. 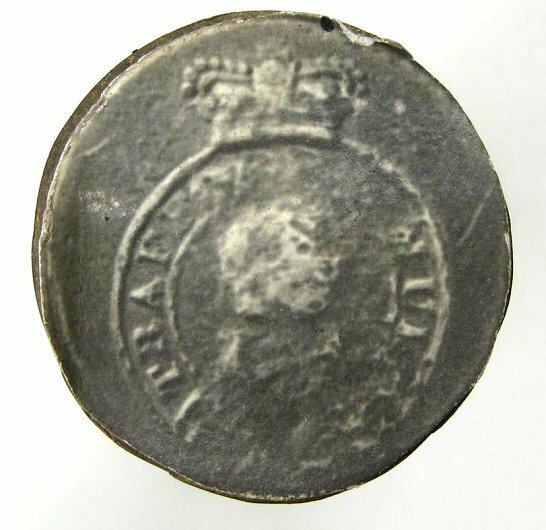 Metal of button not stated.” “FCG” is C F Gaunt of Birmingham, whose collection was bequeathed to Birmingham Museum in 1951; in 1952 this jacket was passed to the King’s Own Royal Regiment Museum at Lancaster, but I have not seen it. 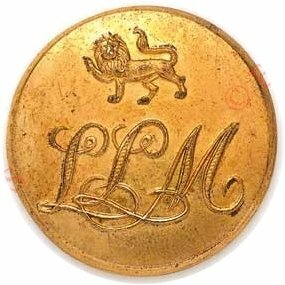 A surviving officer’s button is gilt, 15 mm in diameter, showing a lion over “LLM” in script, the broad strokes of the letters horizontally lined. An other ranks’ version in white metal is in the Gaunt Collection at Birmingham Museum; the design is essentially the same but with no edge, the lettering unlined and the lion a little larger. Major Dawnay’s study of distinctions of rank describes and illustrates a pair of grenadier officer’s epaulettes. The straps are 5½ inches long, of gold fine check lace, edged with pearl purl. The crescents are worked with a purl and spangle edge, with rows of 18 medium bullions, the outer row 2¼ inches in length. At the base of each strap is a grenade, the ball worked in a spiral of pearl purl, the flames in purl and spangles. The buttons are the pattern shown above. Dawnay observes that the straps are the wrong length to have been worn with wings, and seem to be of a style earlier than 1808-16. In 1974 and 1976 the King’s Own Royal Regiment Museum at Lancaster received two separate epaulettes of this regiment. I have not seen these. In 1936 the King’s Own Royal Regiment Museum at Lancaster was given by Hawkes & Co a drummer’s cap attributed to this regiment. I have not seen this, but presume that it is the same “Belgic” cap as sketched at Hawkes’ by an unidentified “JCL”, as shown in Reynolds’ Lancashire notebook. Reynolds assumes that this is of black felt with brass plates. The unusually pointed front is described as 9 inches tall, the body of the cap 5⅛ inches tall, and the rather narrow peak as 1½ inches broad. The circular front plate, 3 inches in diameter, shows “Lancaster” in old English capitals, over a rose, over sprays of leaves, matching the elements of the design of the plate shown at the top of this page. “JCL” notes that there is a hole somewhere unspecified in the upper part of the cap front, and “evidence” that it was worn with a “festoon”. Lieut Col Comm John Silvester, 24 September 1808. I’m not quite sure why this regiment was titled “First”, unless plans to organise a second Manchester regiment did not succeed. A light company officer’s jacket was recently offered by Coldstream Military Antiques. This impressive cavalry styled jacket is single breasted, with collar and cuffs described as black, but which should be understood as a very dark shade of blue. The front has three rows of 17 small regimental buttons, narrowing to the waist, linked by loops of scarlet cord with eyes at the outer rows. The top loops terminate in a whorl on each shoulder. The collar has no buttons, but is edged in a blue-black braid, with eyes at each front corner and above and below at the rear. The cuffs each have four small buttons, with dark blue twist holes. There are two buttons at the rear waist, with four on each pocket flap. The white turnbacks are narrowly edged in dark blue, and the points decorated with gold bullion bugle horns on a dark blue ground. 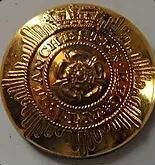 The buttons are gilt, convex, showing a crowned eight rayed star bearing a simple garter inscribed “1st Manchester Regt / ● L M ●”, enclosing a rose. These match surviving examples of 20 or 22 mm diameter. In 2011 an officer’s gilt belt plate was sold on eBay. 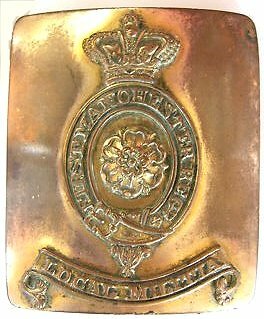 This is rectangular with rounded corners, the design in relief showing a crowned garter enclosing a rose and inscribed “First Manchester Regt” above a ribbon inscribed “Local Militia”, all lettering in serifed capitals. At the National Army Museum is a “coatee” of this regiment, presumably an officer’s coat or jacket, which I have not yet seen, and for which I have no details. Surviving buttons are gilt, convex, diameters given as 25 and 28 mm. The design is a coronet on a garter inscribed “Honi Soit …” etc, enclosing a rose, below “1ST. / REGT.” and above sprays of palm leaves and “M ● L ● M”. Reynolds describes the regimental colour, from the RUSI notebook of militia colours, as garter blue, of “ordinary pattern”, with the title in the centre: “First / Middleton / Local Militia ‘Late Ashton under Lyne Volunteers’”. Lieut Col Comm Robert Keymer, 24 September 1808. 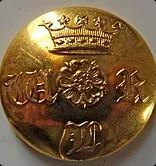 Surviving buttons are gilt, flat, 20 mm in diameter, showing a crown above a rose and leafy stem between “N” and “F”, above “L M”. Reynolds describes the regimental colour, from the RUSI notebook of militia colours, as garter blue, inscribed “Newton & Failsworth L.M.”, with no other details. This colour is said to survive, but I do not know where. Lieut Col Comm John Lees, 24 September 1808. At the National Army Museum is an officer’s coat which has been illustrated by Philip Haythornthwaite, and was once sold by Wallis & Wallis. It has a pair of epaulettes, probably for a field officer. The front has two rows of eleven large buttons, but the cuffs each have one group of three, with two groups of three under each pocket flap. This anomaly suggests that the front buttons were also originally in threes, with two extra buttons later inserted to create regular spacing. 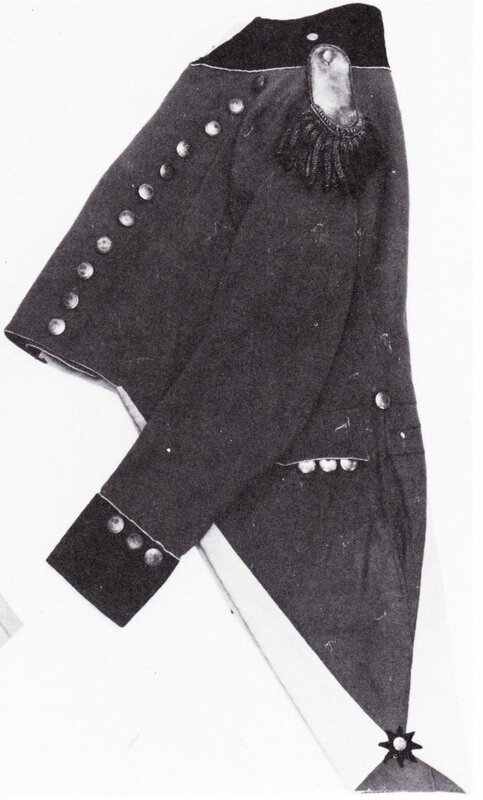 The coat must originally have been made for service in a regiment whose buttons were in threes, and the front later altered for this regiment, so must be regarded as untypical. 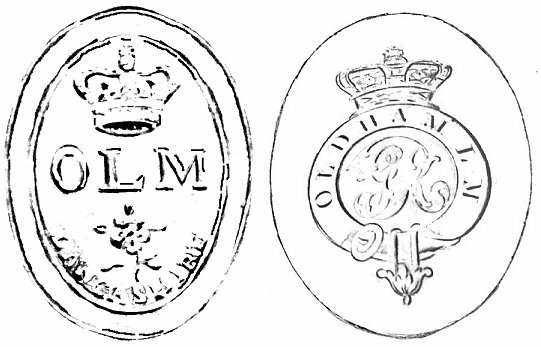 The Oldham commander, John Lees, had been commissioned a lieutenant in the 5th Royal Lancashire Militia (ex 4th Supplementary) in July 1798, a regiment disbanded in 1799; information on the officers’ dress of the 5th is lacking, but the 4th Militia had its buttons in threes and it’s not impossible that the 5th did likewise. The coat has a dark blue collar, lapels and cuffs. The collar, jacket edges, tops of cuffs and sides and lower edges of the pocket flaps are all narrowly edged in white. The collar has a single small button at each side, with a dark blue twist button hole. The cuff buttons presumably have similar holes, though these are not visible in the photo. The pocket flaps have scarlet twist holes above each button. The rear waist has two large buttons, with three pairs of scarlet twist lines running between them. The white turnbacks appear to have no edging; their points are held by a small button on an eight pointed dark blue star. The epaulettes have a rounded top, a gold lace strap which is entirely plain, and a small button. Judging by the photo, the purl of the crescent may incorporate dark blue threads. The gilt buttons match that drawn by Ripley and Moodie, which they give as 22 mm in diameter, the smaller size being about 15 mm. 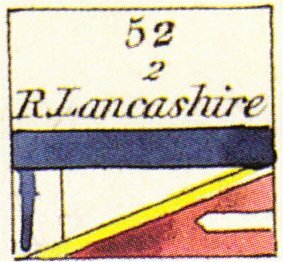 The design, within a circular frame and border, shows a rose above “O L M” and “Lancashire”. At the National Army Museum is a shoulder belt with plate, worn by Captain J Crossley. The belt is white, and the oval gilt plate shows in relief, within an edged border, a crown above “O L M” above a rose and “Lancashire”, matching the buttons. 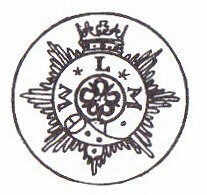 An other ranks’ plate is shown in Iain Wilkinson’s excellent history of Oldham volunteers, courtesy of Richard Boniface; this is oval, brass, the recessed design showing a crowned garter inscribed “Oldham L M” enclosing the Royal cipher. Wilkinson notes that the men’s plates purchased in August 1809 cost 8d, but the sergeants’ 4s 6d, suggesting that the latter were silver plated. Wilkinson notes that white undress jackets were in wear for other ranks and that grey trousers were adopted in July 1813. 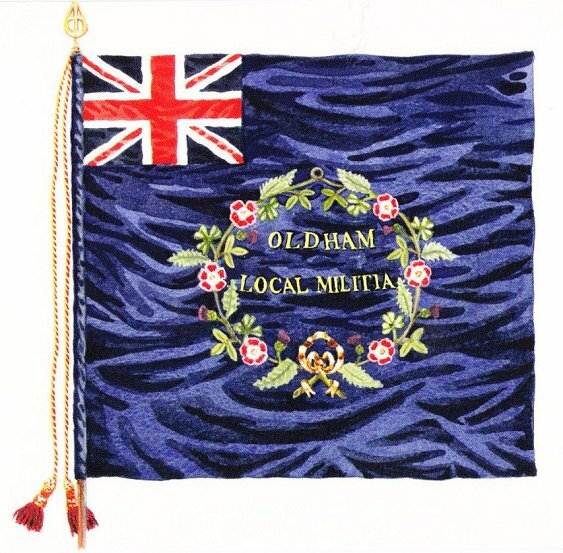 Reynolds describes the regimental colour, from the RUSI notebook of militia colours, as of garter blue, and inscribed “Oldham L.M.”, with no other details. Working from the NAM notebook and from the surviving Newton & Failsworth colour, Wilkinson reconstructs this as shown, with the title spelt out in full in two lines. Lieut Col Comm James Fraser, 24 September 1808. Also “Trafford House & Hulme”. Lieut Col Comm James Cooke, 24 November 1808. Howard Ripley and Denis Darmanin, in an MHS Bulletin, illustrate a button described simply as gilt and convex; the design shows a simple crowned garter inscribed “● Trafford & Hulme ● L ● M”, enclosing the “GR” cipher, on an eight rayed star. The Gaunt Collection at Birmingham Museum contains a cut out photo of an excavated button, apparently of a different design, said to be an other ranks’. This shows a crowned garter inscribed “Trafford &[?] 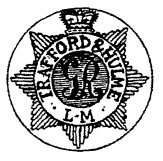 Hulme”, enclosing what must be, though very worn, a rose above “L M”. The lower part of the garter appears to be buckled. At the National Army Museum is an officer’s belt plate, rectangular, gilt; I have not yet seen it and have no further details. Lieut Col Comm J A Borron, 1808; Lieut Col Comm John Ireland Blackburne, 16 March 1809. Reynolds’s Lancashire notebook illustrates and describes the light company officer’s jacket of Ensign, later Lieutenant, Henry Lyon, which I believe is now at the Duke of Lancaster’s Regiment Lancashire Infantry Museum, with an associated cap. It is scarlet with dark blue collar, lapels and cuffs, with two rows of ten small buttons on the front with dark blue twist button holes on the upper three buttons on the lapels, one small button on each side of the collar with a twist hole, four on each cuff with twist holes, and four, spaced as pairs, on the slash pocket flaps, with scarlet twist holes, two at the rear waist and one at the lower end of each pleat. There is no white edging anywhere. The white turnbacks have no edging; their points are decorated with gold embroidered bugles on a dark blue cloth ground. The wings have a gold lace strap with blue edging and a silver bugle, blue wings edged in gold lace with a blue outer edge and gold bullion fringe. The gilt buttons show a coronet over an eight rayed star bearing a garter inscribed “W * L * M”, enclosing a rose. Buttons of the same pattern, but silver plated for a sergeant or senior NCO, are recorded by Reynolds, by Ripley and Moodie, and on the British Military Buttons site. 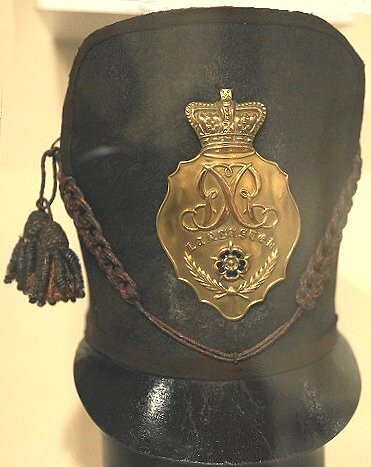 Lyon’s “Belgic” cap is held by the Duke of Lancaster’s Regiment Lancashire Infantry Museum. The black felt is bound with tape; the tape band around the base may possibly have been originally a dark green to denote the light company, unless that is my mis-reading. 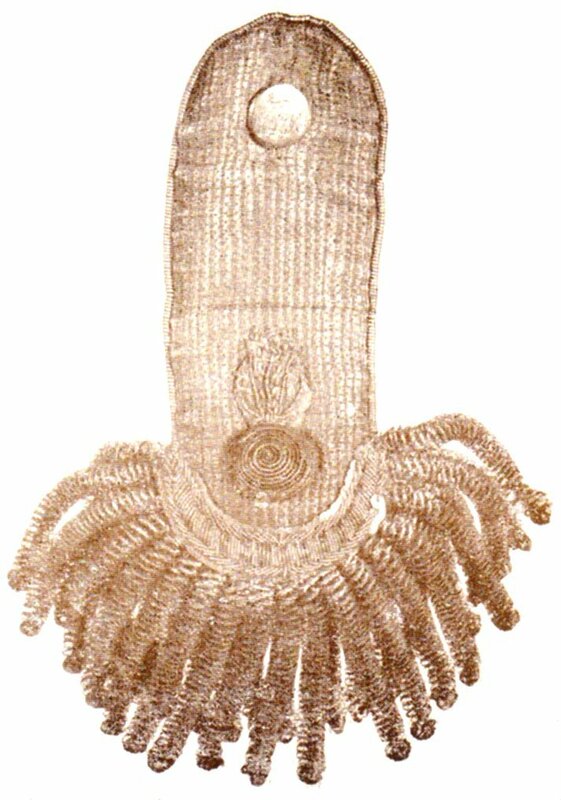 The cords and tassels are of the usual type in gold. The plate is that shown by Reynolds and noted at the top of this page, in gilt with a smooth ground, and with red enamel in the outer five petals of the rose. At the National Army Museum is an officer’s shoulder belt plate, for which I have no details. Unusually, we have specific evidence for the dress of the other ranks of this regiment. As noted at the start of this page, the J & B Pearse materials book contains two brief entries for Warrington. The first, for the men’s jackets, specifies “10 Regular Colestream Loops”, meaning pointed loops spaced singly, “Colestream” meaning the ends of each lace folded back diagonally to create a point, rather than being cut raw. The lace, as discussed at the top of this page, showed a single dark blue line. The second entry is for the lacing on the drummers’ “coat”, meaning jacket. This is given as having ten regular pointed loops on the front (presumably in the men’s looping lace), with narrow or “binding lace” used on the pocket “frames”, tops of cuffs and “all round”, meaning the jacket edges. The drummer’s broad lace was to be used only on the seams (sleeve, side, back) and “body”, meaning the two extra lines of lace running vertically at each side of the front. There is no mention of darts on the sleeves. 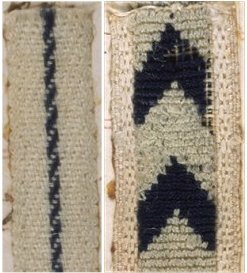 The Pearse sample of the Warrington broad lace is similar to that for the “regular” militia shown at the top of this page, with a dark blue chevron, but has narrow dark blue edges, and a pale yellow ground; the narrow lace would have been half this, i.e. showing a dark blue diagonal band. As discussed at the top of this page, the drummers’ jackets were red faced blue. In the light of the Lyons officer’s cap discussed above, the men would certainly have worn the corresponding form of plate noted at the top of this page, and the drummers probably the plate discussed above for the Lonsdale regiment. Crompton and Venn record that in 1898 the colours of the regiment were held at Warrington Museum. Lieut Col Comm Thomas Strickland Standish, 16 March 1809. I’m not sure why, given that all the local regiments had the same dark blue facings as the Royal Lancashire Militia, this regiment alone should have claimed a “Royal” title. 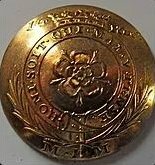 The British Military Buttons site lists a button for this regiment, gilt, convex, diameter 22 mm, showing a coronet above a rose, between “W” and “R” above “L” in old English capitals, presumably for “Wigan Local Regiment” or “Wigan Royal Local”. At the National Army Museum is an officer’s shoulder belt plate, rectangular, brass (presumably gilt), showing a crowned garter inscribed “Royal Wigan Local Militia”, enclosing a rose. I have not yet seen this.